Writing surface of 7 x 11"
The Pearstone SADC-911 is made of white acrylic and designed for use with dry erase markers. This clapboard is especially useful in video, film, or dual-system DSLR sync sound productions. Standard-size color clapper sticks are supplied and the writing surface is 7 x 11". Box Dimensions (LxWxH) 12.1 x 10.4 x 2.4"
We have been working with this on multi cam shots and for synching audio. The long and short of it is simple: It is a good product with good construction and engravings that will never wear down. Two thumbs up for Pearstone! P.S. if you are ordering online I definitely suggest istockonline. This is my sixth or seventh order from them and I could not be more satisfied. They always ship on time and offer some great service. Just the other day I got a ball head that was not as smooth as I had hoped, I sent it back and received a new one that worked fine plus the shipping was on them both ways! thank you istock for a very enjoyable experience. Quality construction. Good basic slate. Finally got chosen to produce a small feature film! At first I though I could just use my hand to make a nice clap but I decided looking professional has got to be worth a few $$ so I invested a couple of bucks into this baby. There is really not much to say it’s a simple piece that works as you would expect and that is exactly what I wanted from a clapboard. It comes in two pieces so you can transport or replace the board. It can also take a good beating at the bottom of a bag or crate. Another small thing I liked, the writing on the board is engraved so it wont wear off. I also appreciated all the labels there was nothing I needed that wasn't there. Overall you get exactly what you bought and exactly what you want from this pearstone item. This is the perfect slate. Slate's should not be super complicated. All I was looking for was a sturdy and well built slate that writes easily and erases without marks. This board is durable and sturdy built to last and the fact that it is extraordinarily light and designed stylishly in a utilitarian way at this low price is amazing. I hit the jackpot on it and I have had shoddy slates before so I am very careful and one look at this one and I know the quality is good. The clap is loud and clear too. Great product great deal. I recommend it. This slate is amazing! I use it on all my films. The acrylic makes the write/erase process easy and it stands out really clearly. The permanent markings are engraved which looks really nice and makes it easy to differentiate from my writing. I used the clapper for synchronizing the the soundtrack with their scenes. Honestly, a good slate and clapper seems like it would be easy to find - I wasn't looking for anything fancy just sturdy construction, easy write and erase, and clapper. Still this is the 3rd slate I bought, it is the cheapest one and by far the best one. I am looking forward to using it and if I ever need another one I am sticking with pearstone. They do it right! There seems to be a common problem with boards like these and it happened to me so I just want to share a quick fix. The nuts on my pearstone slate came a bit loose This was annoying but per the advice of a different reviewer I got some lock-tite and I applied the locktite to the threads. It worked well and I have not had any troubles since. If the screws or nuts are lose on yours I would suggest this fix before you even start using it and you will not regret it. 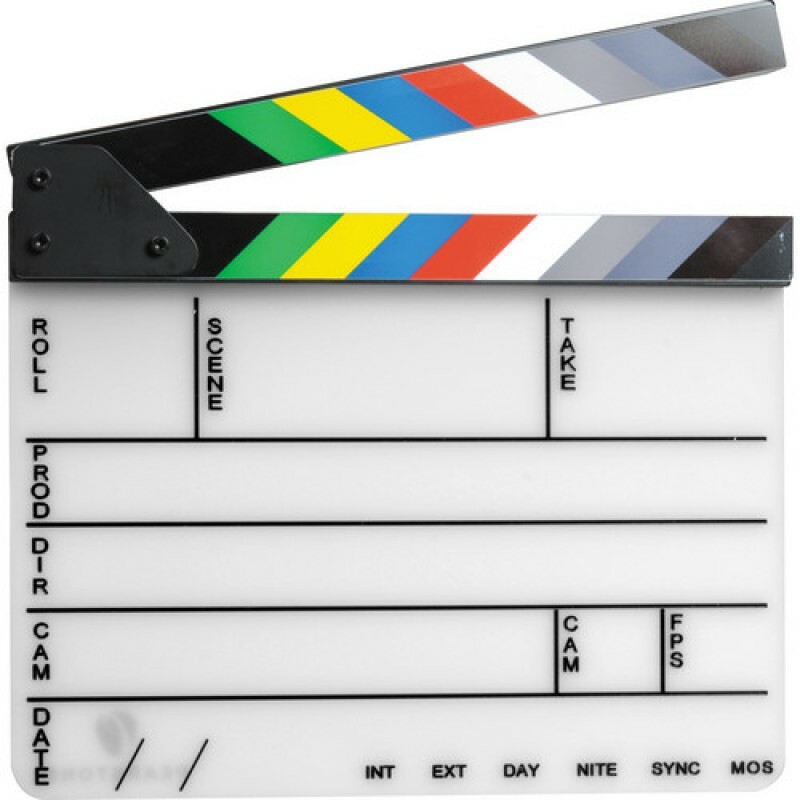 This is a fantastic slate whether you are making a feature film or need it for school. I am using this to sync audio to video recorded on separate devices and I am very happy with it. I didn't see the need to buy an electronic one as this one is very professional and does the job. -The clapper attaches with a magnet for some added convenience. -The white board is typical and the writing on it is clear. -The snapping noise is also clean and is fine for syncing. One caveat, dry/erase markers run out quickly and are expensive if you buy them one at a time. I went to staples and picked up a large pack of fifty and I wont be running out anytime soon. Bottom line if you don't want to spend a bunch of money then this clapboard should do the trick. I got this for use outdoors in the rain and in the snow and so far it has kept up quality. A few tibits-The colored chevrons are not painted on - they are actually thin strips of metal that are glued on. They are glued on well and look professional. The back has black and white bars on sticks with solid white board. The engravings are nice and wont wear down. The sound is good and solid it is fine for use to synch seperate audio and video. Also, I almost forgot to mention, I noticed, the black paint on the hinges can scratch off watch out for that, you also might want to just repaint it so it continues to look professional. All things considered, it feels well made and it is cheap so I am proud of this purchase. Before I got this I was clapping the two nearest items that I found lying about so I was pretty amped when I finally found enough time to head to istock and order this. I used it about ten times and I was very satisfied but then my colleague accidentally wrote on the white board with permanent marker. I was pretty sure the board was a gonner but thankfully my friend felt bad about ruining my piece and got me some permanent marker remover. The white board is now clean I love the multi colored front. As a whole this is a great product for the $ and if you do use permanent marker by accident you can easily remove it with some soap. Sorry about the long story I will now summarize get this clapboard. This is a very simple and basic slate but it is exactly how its described so no complaints. One minor thing however did come up: The nuts in the back were a bit loose. This would have been a deal breaker and I would have sent it back but I saw that some other people had used locktight and solved this very problem. So I went ahead and followed the instructions on a bottle of lock tight and it promptly fixed the issue. All in all I would say I got good value given what I paid for it. I originally wanted to DIY so I bought the necessary materials, rolled up my sleeves, and got to work. However, it came out pretty bad and the clapping noise was off. I promptly gave up my carpentry aspirations and just picked this up from Pearstone. It is much better than the one I built and feels constructed very well. I like the color bars and I now never have to guess what the color is! For storing I put it in a laptop sleeve that is 14' and it also comes apart into two pieces for compact storage.